Daniel James has come a long way in a short time - hardly surprising for a player whose pace sets him apart from the also-rans. The Swansea City winger marked his first competitive start for Wales with a spectacular winner in a crucial 1-0 win over Slovakia in Cardiff. Almost sold by Swansea in January; scorer of the goal of the FA Cup fifth round against Brentford in February and in March a Euro 2020 qualifying match-winner for Wales. 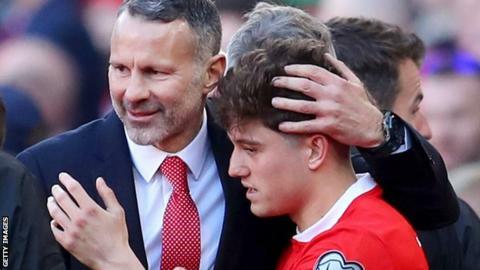 After announcing his arrival in the international game in some style, James paid tribute to the influence of Wales captain Gareth Bale and manager Ryan Giggs. At 21 James is already four years older than both those legends were when they made their competitive debuts for Wales, and was grateful for their words of wisdom before taking on Slovakia. "It's massive for me to learn off the gaffer and Gareth," James said. "They've obviously shown a lot to me and the gaffer said to me before the game 'go and do what you've been doing at Swansea'. "Gareth just said 'keep getting at the full-back' and that's what I did." James was handed his second cap by Giggs in a bold selection by the manager, who has placed a strong emphasis on youth and pace. Bale led Wales' forward line with James and fellow wingers David Brooks (21) and Harry Wilson (22) in support. "It's massive the way the gaffer has trusted in all of us," James added. "It gives us loads of licence, especially going forward. "Obviously you've got to do the defensive bits, but when we've got the ball in midfield we've got players who can find us in behind." Slovakia and group favourites Croatia had won their opening qualifiers and James said Wales were well aware of the need for a good start in Cardiff. Giggs' side are next in action in back-to-back qualifiers in Croatia on 8 June and four days later in Hungary, who beat the World Cup runners-up 2-1 on Sunday to give a boost to Wales in Group E.
"A few teams got points on the board the other day and the pressure was on us," James said. "We've got two tough games in the summer now. When we join up in the summer we've got to prepare right for those two games. "All the boys are looking forward to them." Having seen a proposed move to Leeds United collapse on transfer deadline day in January, James remains in talks over his future with the Swans. Speculation about his long-term club future has continued and James said: "It's about concentrating on the football for me. "This time last season I wasn't playing first-team football, but it's something [moving] that can happen.